Since the mid-80s, Additive Manufacture (AM) has developed to now be the most optimal Rapid Prototyping technology and an alternative to conventional manufacturing for final products. The AM industry is projected to reach $12.8 Billion this year with an annual growth of 15%. The additive nature of AM allows for more efficient production in terms of both speed and use of materials in comparison to alternatives of a subtractive nature such as CNC Machining. Furthermore, AM technologies can now produce parts of similar mechanical properties to those produced by conventional manufacturing methods such as Injection Moulding. Selective Laser Sintered Polyamide 12 parts achieve a Tensile strength 48 MPa and a Flexural strength of 58 Mpa while Injection Moulded ABS parts achieve a Tensile strength of up to 45 MPa and a Flexural strength of 73 MPa., Other AM processes such as Polyjet have a selection of materials designed to simulate the mechanical properties of conventional manufacturing materials such as Silicone, different types of Rubber, and Polycarbonate. These have enabled AM to be ideal for Rapid Prototyping within the product design and development cycle as the produced prototypes are of a quality close to that of the intended final product. Selective Laser Sintering (SLS) is offered by major 3D printing bureaus such as Shapeways and Objective3D and has for some time been the AM process that produces the best mechanically performing plastic parts rapidly and cost-effectively. It is a process whereby a laser beam is used to fuse a thermopolymer layer by layer within a bed of the material in powder form. It requires less post-processing in comparison to other AM processes and the Polyamide (Nylon) parts produced are of a greater surface quality to other AM processes. Multi Jet Fusion (MJF) has recently experienced great improvement thanks to HP’s Voxel technology. MJF deposits a fusing agent on a bed of thermopolymer layer by layer. It too, produces parts in Polyamide (Nylon) polymer therefore achieving good mechanical properties. 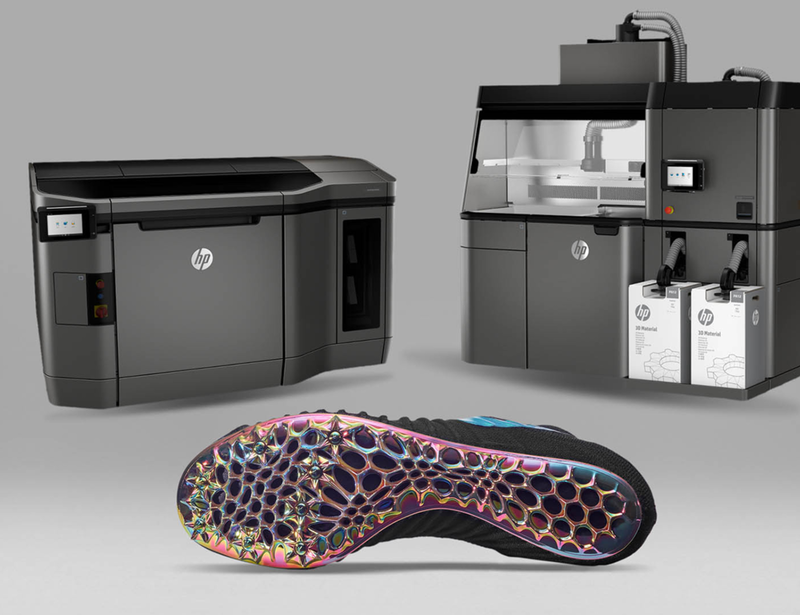 HP’s Voxel technology, which allows for control of properties with precision of up to 25 microns, has enabled HP to deliver a superior AM process to SLS. Additionally, with the Voxel technology, they can 3D print coloured parts including multiple colours within the same part. HP’s MJF process utilises multiple deposition heads per layer and therefore prints parts significantly faster than SLS, and in addition to the fusing agent, it deposits a detailing agent and utilises controlled heat producing parts of a greater surface quality to SLS. The ability to produce strong coloured parts with a good surface finish, positions HP’s MJF technology as the prime option for End-Use Additive Manufacturing. 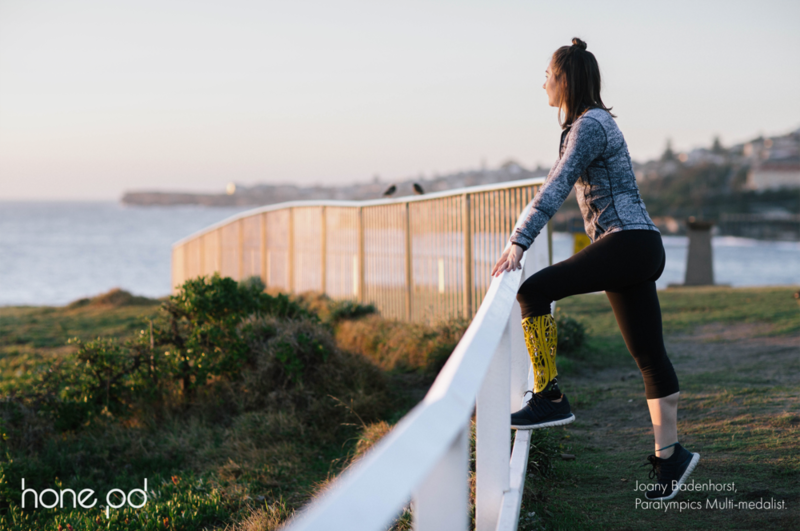 At Hone PD we have had the opportunity to design and produce products with both SLS and MJF for end-use including designing product for Melbourne based, Form Prosthetics. Form’s prosthetic covers enable amputees to be more confident regarding their prosthetic limbs through the beautiful and expressive aesthetics of the covers. 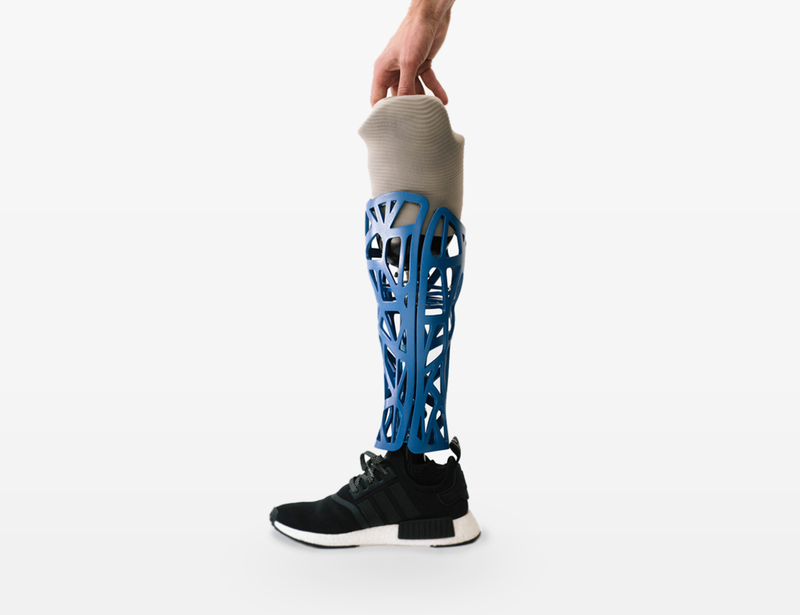 The first product designed for Form were covers customised for each amputee by mirroring their intact limb. A manufacturing process that allows for financially feasible production of unique units of the product was therefore required, making AM ideal. Throughout the design process, various AM processes and materials were considered and tested, of which, SLS Nylon 12 emerged superior. AM allowed us to reduce the number of components within the product through its ability to achieve complex forms. It eliminated issues presented by conventional manufacturing such as undercuts and need of drafted surfaces. Implementation of Design for Additive Manufacturing guidelines enabled us to produce robust covers more than capable of withstanding mechanical stresses of day-to-day activities. After production, the post-processing involved on the covers included cleaning with air blasting, priming, and painting.
. However, the requirement for multiple sizes & patterns would necessitate a significant start up investment to produce many Injection Moulding tools. Due to the market volumes, even in this scenario, AM may present potential benefits over conventional manufacturing, specifically the elimination of high setup capital barriers, illustrating the earlier mentioned opportunity AM can present to small business. With HP’s MJF technology now being available, products like the Form standardised cover can be produced with minimal post-processing as the parts are printed in colour and with an improved surface finish. Other businesses utilising Additive Manufacturing for End-Use to bring their ideas to fruition include Nervous System who create jewellery, art, and homewares of unconventionally beautiful organic geometry in various AM materials. Preceyes, another example, produce components for their high-precision eye-surgery robots using AM which suits their need of quick iterations and low volumes. AM is still rapidly advancing as demonstrated by companies such as Carbon who are developing processes that will increase the speed and quality of 3D printing. Such advancements keep the dream of AM’s Industrial Revolution alive and bring it closer to an indisputable reality. At Hone PD Melbourne, like many others in the product design industry in Australia and abroad, we continue to seek more opportunities of maximising Additive Manufacturing’s capabilities to develop better products quicker and more affordably for our clients and consumers.